What begins as a mystery soon spirals into chaotic obsession as Clay struggles to piece together Lucian’s dark tale of love, ambition and grace — only to discover that the demon’s story has become his own. What a haunting book. I heard about Tosca Lee from Camy, and after reading about the book on the official website (especially after reading this page) I knew I had to get this book. 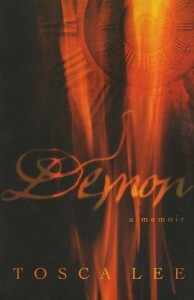 Demon: A Memoir gives us a view of the whole Salvation history from another point of view: a demon. It’s kind of creepy at first when you think of it, but like Clay, I got curious. What could a demon know about salvation? What could he possibly tell Clay, and what could Clay possibly gain from all this? The novel had no frills about it. Clay wasn’t a righteous guy, he wasn’t even religious at all. He’s drifting in his life, finding no meaning until his encounter with Lucian. Tosca draws a very different picture of a demon — not one with an image we know, with horns and bat-like wings, but drawing from the story of the first fall: Lucifer. There were no bargains for the soul for Clay, although it seemed like he almost sold his soul to the devil as he became obsessed with the story. Lucian was a very interesting character too, taking on a lot of forms of humans because he liked to “test” them out. He started out as a Mediterranean-looking man and then later met Clay as a woman and then a geeky teen — it seemed like he could not get enough of the “clay” people, regardless of age. He was also fascinated with humans eating, and made sure Clay was eating almost every time they met. His hurried manner at some parts of the story makes you wonder who exactly is out to get the demon — Lucifer? Another hoard of demons? But why? And why is he talking to Clay in the first place? Like I said, it’s a way to view the story of our salvation from another side. It almost comes to a point that I felt some sympathy for Lucian and I wished there was something better for him…and in the same way, it made me realize how lucky I was to be created in God’s image and likeness. How infinite my chances are, how much patience God has for me. How forgiving God is for someone like me who commits the same mistake over and over again. It’s…amazing. And humbling. The ending of the novel is satisfying in a way that it’s not wrapped in neat bows nor it is terribly disturbing. The book reminds us of a choice that everyone has to make in this life. What will you choose?